Unless they actually put some out in the stores which seems unlikely at this point. Zedd will be one per case. Nothing has changed in this regard. My Amazon order hasn't changed. Delivery set for May 3rd. 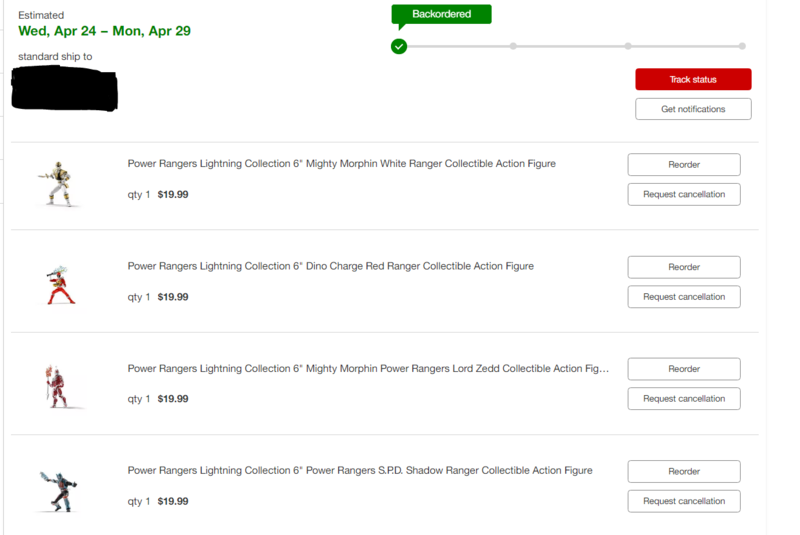 I'm not sure if I asked this before (my memory is terrible), is the Lightning Collection just for figures only, or will they be re-releasing and or deluxe-ifying the morphers as well (similar to japonese bandai deluxe collection of recent??? It would love a 2-piece set of the in space morphers. The astro morphers (re-release or remake of original, please not voice activated like problem japon version) and Zane's phone morphers. We honestly don't know what Hasbro's plans are. It's just too early for all of that. They may not even label that kind of stuff as Lightning. J Hernandez, a favorite reviewer of mine, reviewed the White Ranger, and he really does a great job showing off his articulation. Hope we see images of the second wave soon. Mmpr Pink is the only figure I want so far. Just got my shipping confirmation on Zedd. So Wednesday it is. My Amazon Zedd should be here tomorrow, and my rangers from Walmart don’t show any movement. However they are in stock because all but DC Red appear to have sold out. Curious, when did folks place their orders? I slept on Zedd and didn't order until February 17, so I'm probably well down the queue. I pre-ordered February 17th. My order is still estimating delivery between May 7-10th. Hasbro Pulse pre-sold out pretty quickly. Not as quick as Amazon, but it was only listed a short while before it was no longer available to order. The figure is still listed, but the button to buy it says Sold Out. I recall Hasbro Pulse selling out quicker, which is why I ordered from Amazon. Same, just a further-out estimate, but that's logistics. Perhaps we'll get updates tomorrow. You remember right. The surge of Amazon orders came after Pulse sold out. I think that was right after we learned he was 1 per case. I went with Amazon and it hasn't changed from May 3 for me. My Target has them all out. Three of White, 2 of DC Red, 2 of Shadow and 1 Zedd. Street dated here for the 21st as well, however my store is closed for Easter, so they won’t be out till Monday. I was good to tell them, so all of the figures were removed while I was standing there. Man, they all looked soooooo good. Would it have given you an error if you had tried to buy them? Probably? Usually it does. But my store is really good about NOT putting things out. So the box must not say anything and this is strictly a Target street date and not widespread. Street dates for toys that arent based on some secretive movie spoiler is such a stupid concept. Completely agreed. Unless there's a strict resetting of shelves, I can see it. But when they already have the pegs out, then they should be good. However, isn't Target having that sale where you buy $50 and get a gift card or something? I'm wondering if they're purposefully holding them back for the promotion to end? As if it's not necessarily a street date, but more from the fact that Hasbro stated that they can't be used for promotions already in effect. Or that is a Target mandate. Could be why some stores say this Sunday and some the 1st. Promotions run longer at some places than others. I don't know, just thinking out loud. I ordered from target as well, on February 16, mine is saying the same. That "backordered" has me nervous, fingers crossed it doesn't amount to much. Very jealous of everybody getting theirs early.